What a relief to wake up to a clear, baby blue sky after all the rain yesterday! A good start, I thought, as Paul and I packed the two vans with boxes, bags, exterior search articles, scents, paperwork, rosettes and all the other paraphernalia needed to run a Trial at 3 Levels all in a day. We arrived in good time at the venue to find the overflow carpark, where I’d planned to do vehicle and exterior searches, was locked. This was because of the rain the previous day which makes parts of the car park area rather muddy. A quick chat and rethink with Susan Benson resolved the issue, but I really don’t cope well with last minute changes. My near panic about fitting everyone into what was left of the car park areas was quite needless, as our lovely handlers buddied up and several had shared vehicles, thank you. Judges Karen Denton and Annette Leslie arrived in good time to help get everything set up and ready for action. We ran the Level 1 searches in the morning and then Levels 2 and 3 in the afternoon. Karen and Annette each did an interior and exterior search at the same time, so we rattled through Level 1 and had finished in good time for a break and lunch. Then more again in the afternoon and we were done by 4pm and time left for a clear up. Thank you so much to our excellent judges for a splendid day. Thank you too Paul Bailey for his speedy work entering the scores electronically so that the timings were added up automatically, without the need of the dreaded calculator, phew! Our team of helpers were fantastic and kept everything moving along smoothly by alerting handlers to their next turn in the running order. They all worked well to ensure safe passage for the dog who needed quite a bit of space away from others from his cosy crate to each of the search areas. This is partly why I love this new sport, as even our more sensitive and scared dogs can participate and do well. 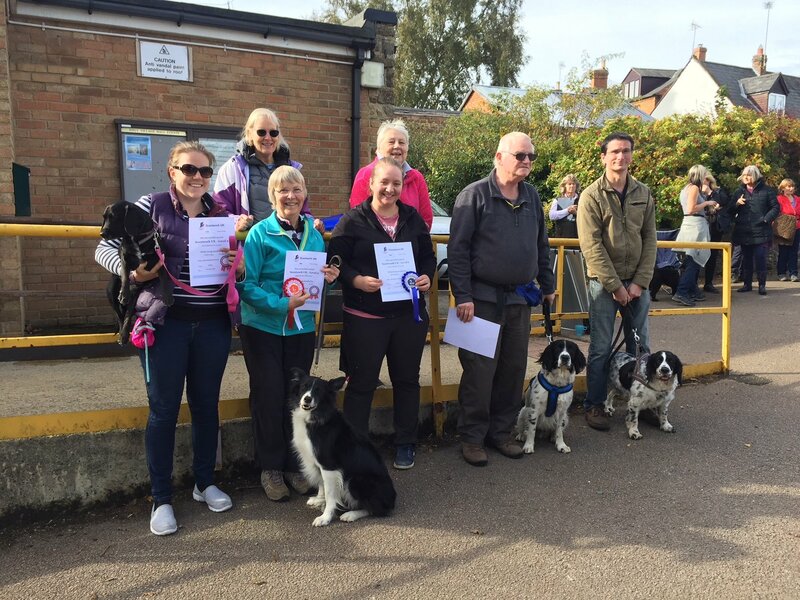 And last, but most importantly a huge thankyou to all of you who travelled to compete at the Byfield Trial. Thank you for the feedback, as it seems that you all liked the venue. Many also appreciated the short waiting times between searches and the nice short day. You were all fantastic and great with your dogs. I hope you enjoyed your time with us, and if you didn’t qualify this time remember there is always another day. The weather was perfect for today’s Trial being cool, reasonably still and bright. I had the pleasure of judging L1, 2 & 3 alongside Annette Leslie and we took an interior and exterior search for each of the Levels. 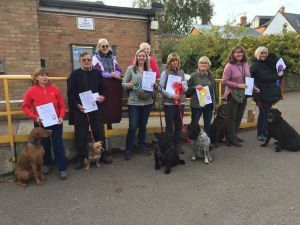 It’s always interesting to see the progression from the Level 1 folk at the start of their Scentwork journey upwards to Level 3 where the handlers are much more experienced and have learned to read their dogs well thereby giving the dog confidence to work more independently and effectively. I would, however, have liked to see more dogs working off lead for the inside searches and have the opportunity to be free to make a choice about where they’d like to search rather than being guided quite so much. In the L1 vehicle search I hid the scent on the tow bar cap which the dogs arrived at as soon as they’d gone through the cones. The dilemma for the handlers was whether to call it or carry on round the car. Most decided to call the alert and this resulted in some super speedy times. The quickest was Sue & Ruby in 13 seconds! Nobody took longer than 1.5 minutes for the car search. Amazing. The Bags and Boxes search also saw some very quick times but, in some cases alas, too quick, as folk called the wrong item. 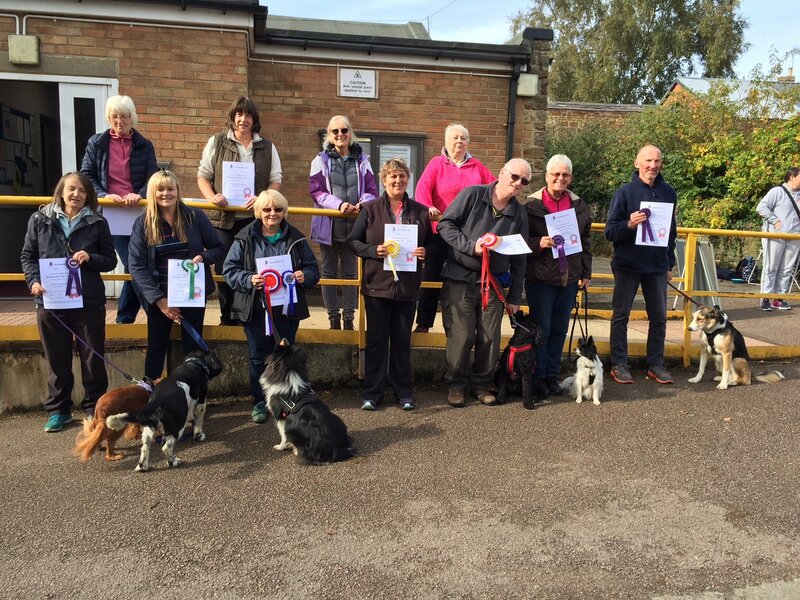 Notables with lovely handling in this exercise were Sandra & Archie, Nicola & Timber, and Julia & Dandy. Overall winner of L1 was Keith & Lexi and 2nd was Gloria & Dylan who also won her Excellent title. Congratulations folks. The L2 Vehicle search was fabulous as every dog found both scents with handlers realising that the find was on the other side of the car if the dog tried to go underneath. 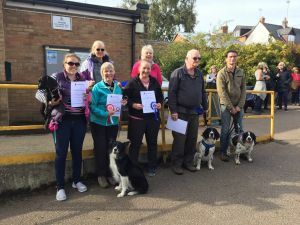 Colette’s Lola gave a beautiful indication and Lynda & Max worked very impressively in this search and every exercise and they took the red rosette. Well done. Kym handled Max very well and came 2nd and Martin & Max got 3rd and did really well with an impressive overall time. After a quick break and a lovely lunch the L3 teams were ready to start their competition. Notables in Level 3 were Helen & Nellie who won the Excellent award after their superb teamwork. What a superstar Nellie was going straight to the scented item and giving beautiful indications at each. They took 2nd place. Tilly came 1st with some very quiet but assured handling from her owner, Sue. Well done folks. Even at this Level, I felt that one or two dogs may benefit from freedom from the lead, particularly inside. Remember that you can always put the lead on during a search if the dog needs that umbilical attachment for confidence or focus. The day ran very smoothly due to Karen Kendall’s super organisational skills and I’m going to adopt her great idea at my next Trial of giving each Judge their own kit with scent swatches, scissors, tape, gloves, forceps etc to save the judge/scribe or runner chasing around looking for the Trials manager and the necessary equipment! I’d like to thank Karen for inviting me to judge this Trial. I had a lovely day with lovely people and pooches and was well looked after. I’d also like to thank my scribes Harry and Claire and Keith, the runner, and Sue for lots of hot cups of tea. Thank you to Karen Kendall for inviting me to jointly judge Levels 1, 2 and 3 with Karen Denton – I had a fabulous day and enjoyed watching and appreciating the skill of many great teams. Fabulous venue, dry weather and a brilliant team of helpers who reflect the teamwork this sport is famous for; particular thanks to the lovely Jo who scribed and stewarded for me. Overall some lovely work to enjoy, everyone well capable of achieving the level they had entered and some teams where the future potential was shining brightly. Of particular note was the quality of handling – calm, encouraging and true partnerships. Level One: Tables and Chairs followed by Exterior Search. The doors within the hall had been much opened and closed by the time of the test meaning that the clove scent had moved and plumed well across and under the table – most of the dogs worked well and scented to source. My exterior item was a brick; whilst the competitors knew the brick was one of the 3 items everyone worked a complete search which was very enjoyable to watch; particularly of note was John’s dog Skip who worked independently and fluidly across the search area. Our winner Keith with Lexi worked in such a quiet, fluid way illustrating the partnership they have built – very impressive. In the first task I had set both scents close to the entrance cones, keen to see how the teams would read/react to such quick finds, clarity of indication and confidence between the winning team enabled them to build up a fabulous time by being able to read and alert so quickly – well done Lynda and Max. The exterior items were a log and a spout of a sink tap, I was looking for teams that investigated the items as the scent had been pushed into rather than on the items – both Kym and Max and Martin and Max worked the search area in a methodical way enabling both dogs to really shine. You’ll see from the above that great dogs called Max were today’s theme. The three vehicles were parked in an unusual configuration which I think gave both handlers and dogs a moment’s thought. All but one team chose to work this in a directed style, Harry read the wind direction and asked Rosie to free search on line, using the wind which was blowing the scent onto the start cones to achieve a fabulously quick search time. I chose to use two laptop style bags for holding the scent – whilst the dogs found the scents easily, one or two teams hesitated against calling the second bag. 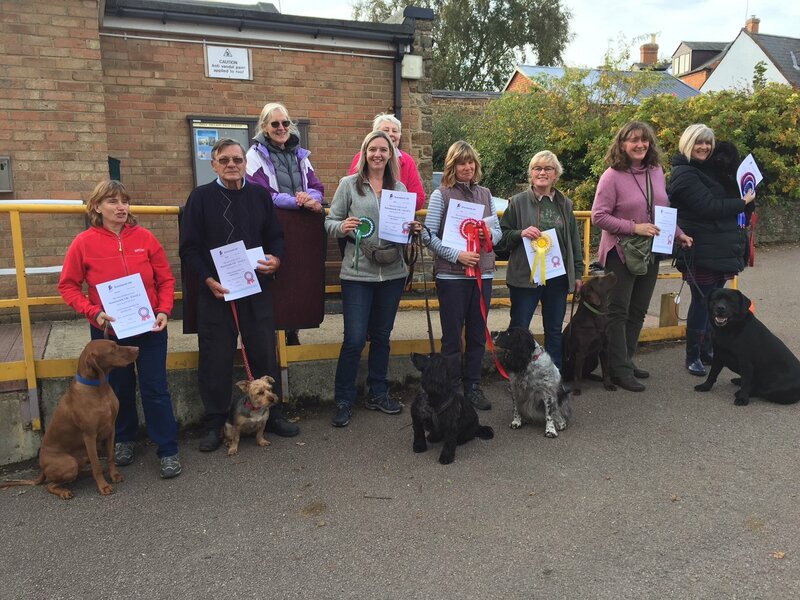 Our winner Sue with Tilly gave a masterclass in handling; quiet, calm and confident – great teamwork. Thank you to all the competitors who worked today.